The government’s seizure of Bogota’s top broker leaves Latin America’s hottest securities market without a clear leader. But Interbolsa’s failure may highlight Colombia’s financial and regulatory charms, and make way for new players with ambitions of regional dominance. 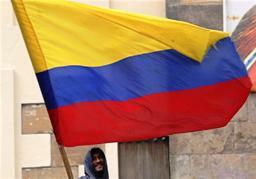 A Colombian man waves a flag at downtown in Bogota May 27, 2010. Colombia last week decided to go against the tried formula of creating a liquid benchmark by multiple taps and issued US$2bn in one transaction. Colombia’s financial markets regulator took administrative control of the country’s largest stock broker, Interbolsa, on Nov. 2, citing liquidity issues. Regulatory officials said the intervention could last as long as four months before they can determine whether the brokerage remains viable or should be liquidated. Regulators said the company had failed to honor a payment of one of its obligations for roughly $11 million on Nov. 1, which prompted the takeover. Colombia’s local bourse suspended the trading of Interbolsa stock for five days on Nov. 2, a day after Interbolsa officials confirmed that the firm’s brokerage arm was suffering from low liquidity. Interbolsa shares lost 30 percent following the confirmation of its troubles. The troubled brokerage is part of the publicly listed financial group Interbolsa, based in Bogota, that also offers investment banking services, market-making and portfolio management, with branches in Panama, Brazil, the Virgin Islands and the United States. That group is 30 percent owned by local businessman Victor Maldonado, with another 15 percent of the stock in the hands of Interbolsa Chairman Rodrigo Jaramillo. An additional 15 percent remains in the hands of former employees of Inversionistas de Colombia, a brokerage firm purchased by Interbolsa. The rest of the stock is largely owned by public investors.